Let's say that we just did a whole big keyword brainstorming session and now we have a list of 50, 500, or even 5,000 potential keywords. It is now time to evaluate them and find out if they are winnable. So what will we need for this? What is a winnable keyword defined as? The keyword has to be relevant to what we're seeking. It has to address the pain, the need, or the interest of our target audience. If it's not relevant, it's not useful. In terms of relevancy, you have to make sure the keywords you're seeking fit the relevant search you're trying to connect with. For example, if you have a bed and breakfast in Rutland, Vermont, the keyword phrase "bed and breakfast" really isn't that relevant to you. Why? It could pertain to any "B&B" in the world and not the area that is relevant to you. A relevant phrase in this example might be "bed and breakfast in Rutland Vermont." The keyword has to have a difficulty score of less than 50. The ranking ranges from 0-100, the lower the score, the lower the difficulty and vice versa. We want to target words or phrases that are generally less than 50. In some instances we can go up to 60, we will be discussing these are exceptions later on. 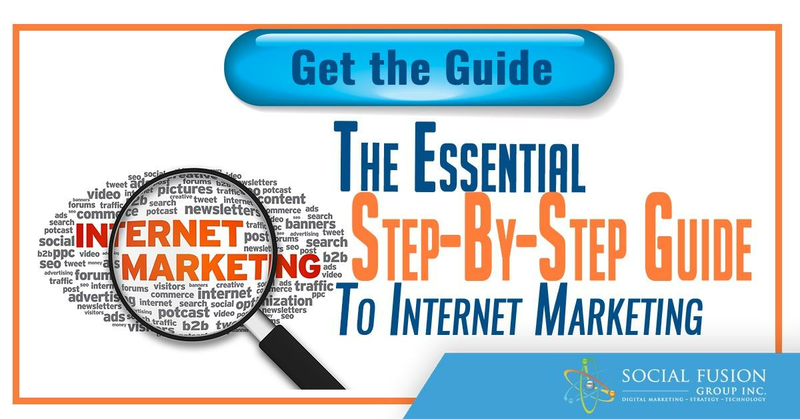 The keyword will need to have a search volume of at least 100 per month. Anything less than that will probably not be worth pursuing. The ROI simply is not going to be there, meaning there is not enough search volume for the work & effort we are going to expend. Let's take a look at the tool SEMrush. In our example, we will be using a paid version, but they do have a free version that allows you to evaluate up to 10 keywords. Try it yourself below. Remember, we're looking for keywords that are relevant, have a difficulty score of less than 50, and have monthly search volumes greater than 100. For the sake of the example we are going to assume that each one of these keywords are relevant. The difficulty, we’re looking for has to be less than 50 and the search volume over 100. 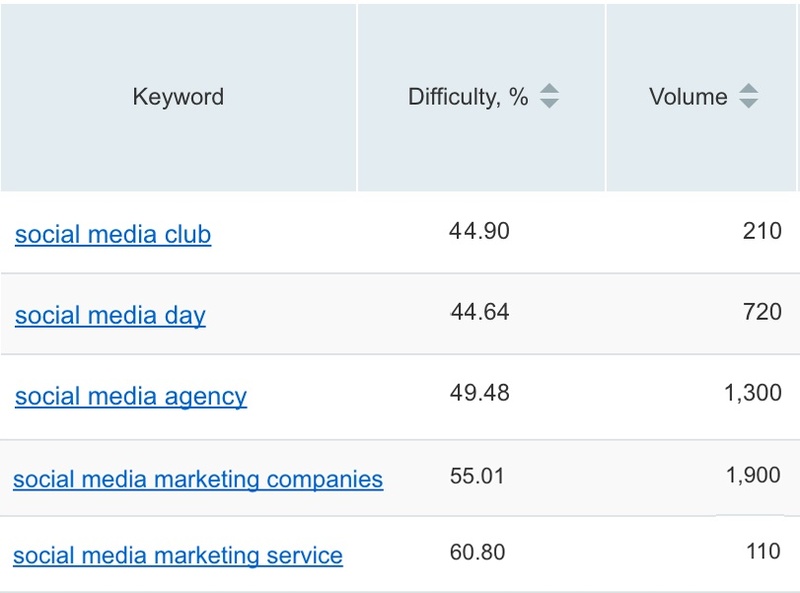 For the first keyword, "Social media club" the difficulty less than 50 and the volume is greater than 100. This is therefore considered winnable. "Social media day" has a search volume of 720 with a difficulty of 44.64. Winnable. 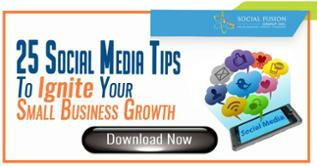 "Social media marketing companies" has a difficulty of 55.01. In general, everything being the same, we probably wouldn't go after that one. However, look at the volume here: 1,900 searches per month. This is a little bit outside of the sweet spot, but given the volume, we could actually go after this. The volume is strong enough to incent us to go after that keyword phrase, assuming all these phrases are relevant to what it is we're seeking. Contrarily, "Social media marketing service," has a difficulty of 60.80 and a search volume of 110. Despite the volume being slightly higher than our lowest-level volume, competition is considered high for the amount of searches, so we would say no to this one. Let’s look at another more example. Let's assume we are a law practice and are focused on helping people with student loans by reducing their debt. Let’s look at some possible keywords. 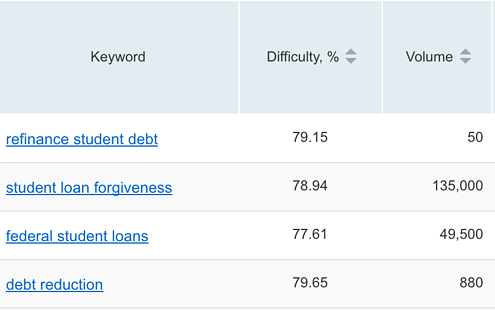 "Refinance student debt" The difficulty's too high, there is no search volume, so it is not winnable. Also it is not very relevant. "Student loan forgiveness," the difficulty is very high, but the volume makes up for it. Unfortunately, we are not going to be able to go after this one, at least organically. Perhaps we could do something on a pay-per-click side, but that's out of the scope of what we're talking about right now. "Federal student loans," the relevancy may or may not be there, because there are also private student loans. The volume is great, the difficulty is too high, and there is question with the relevancy. So it is safer to stay away from this one. "Debt reduction," We would get rid of that one right there. The topic could apply to anything. It also has a high difficulty. We just went through the brainstorm with our evaluation and they all got wiped out. What do we do now? This is where we need to rerun the brainstorm process again to find more keywords to evaluate. That's why it's so important to have different ways of finding brainstormed keywords, because once you pull them into the evaluation process, the odds are pretty strong you're going to start eliminating them. At the end of the day you might only be left with a handful, and if you are putting together a website or multiple pages, you are going to multiple keywords. Thus, you might just have to repeat this process quite a few times. Ultimately, the goal should be this: I want a list of winnable keywords that I could use in both my site and across my content when I create my quality content. While the brainstorming and evaluation processes might seem like a straightforward, there will always be challenges you must be prepared to face. You might be saying to yourself, "This looks difficult. I can't find keywords that fit my criteria." That is going to be a very rare exception. With all the keywords and potential opportunities that exist out there, you have to keep hammering away at this process. Whatever you do, don’t get discouraged. Sometimes this process just needs some extra time. 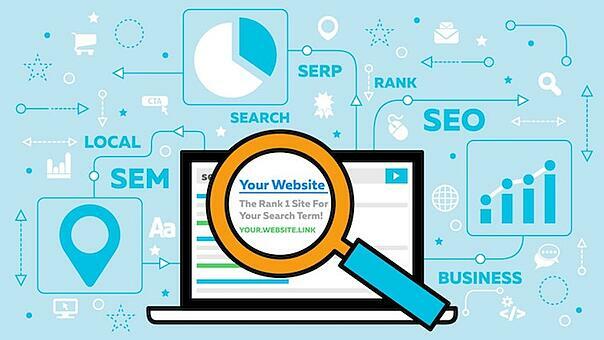 Don't focus on keywords with 0 traffic. No volume equals no traffic to you. Make sure you're able to write around the winnable keywords. Some of the keywords that you will find as winnable may be very difficult to integrate naturally into some forms of content. Make sure that you're going after a keyword that is relevant to you and your audience. Avoid addressing optimization haphazardly. That's the recipe for minimal benefit at best. Note: if you're able to build authority, you're actually going to win on Google and SEO. This is because the search engine is looking for authority-type sites for traffic to be pushed to. The first step is doing a keyword discovery process and making sure that we understand how to find potential words that fit our audience. Then we are going to evaluate those words and we want to evaluate them based on relevancy. We base this on their difficulty and the volume of monthly searches. You won't find many winnable keywords the first time, but it's important to continue the process over and over until you can find the proper amount of keywords.